press UP arrow key to increase the zoom ratio. press DOWN arrow key to decrease the zoom ratio. press RIGHT arrow key to increase the zoom window size. press LEFT arrow key to decrease the zoom window size. Guatemala. Republic. Silver Specimen Proof Peso, 1894-H (Heaton mint). Eliz-137; WR-20; KM-210. 24.69 grams. Decimal coinage, modified designs. Female personification seated left, holding scales and cornucopia, arm resting on inscribed pillar. 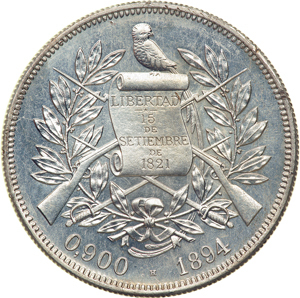 Reverse: Constitution surmounted by quetzal, wreath and crossed weapons around. Fine milled edge. Superb strike. Devices lustrous and fields very reflective. Faint gold toning and very attractive. Limited issue and rare. NGC graded Specimen 65. The Heaton mint, located in Birmingjam England, served as a special mint for many nations' coins. Originally established as a private mint in 1850, the Heaton mint cooperated with the Royal Mint in London, but was an independent entity. Owned by Ralph Heaton and Sons, its independent status enabled the mint to take many overseas orders. 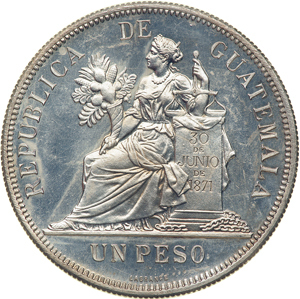 The first of these were for Commonwealth issues (Canada, South Africa, and India), but later nations such as Guatemala were availing themselves of the mint as well. Estimated Value $2,000 - 2,500.